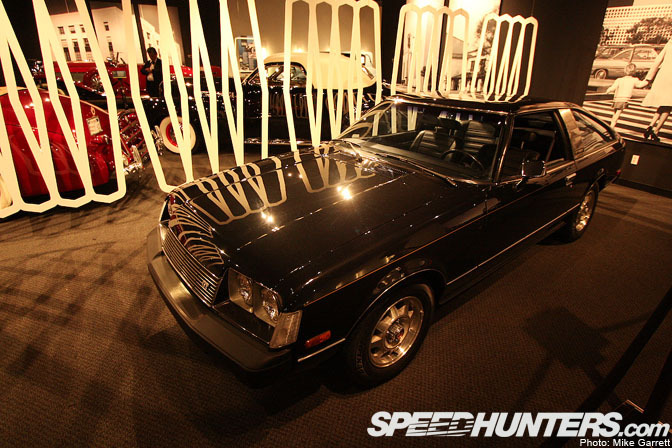 Alright, let's continue where we left off yesterday with my visit to LA's Petersen Automotive Museum. Just as there was an exhibit showcasing a period speed shop, there was another right across the way portraying a 1950's custom car builder. 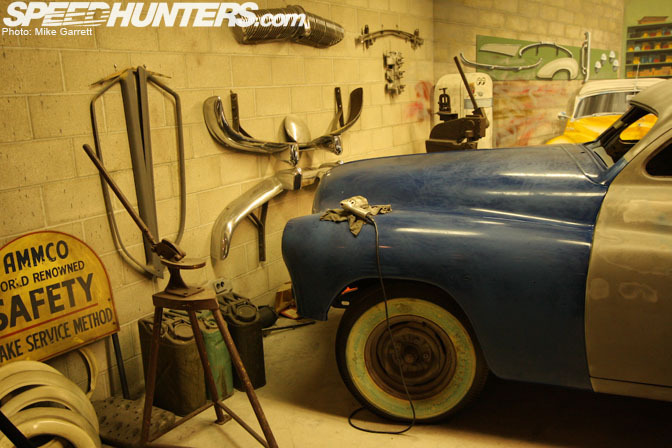 The centerpiece is the unfinished Merc being prepped for paint. 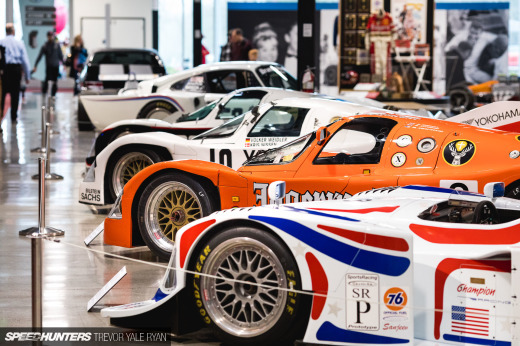 If you didn't know this was a museum, these could easily pass as photos from a real garage. 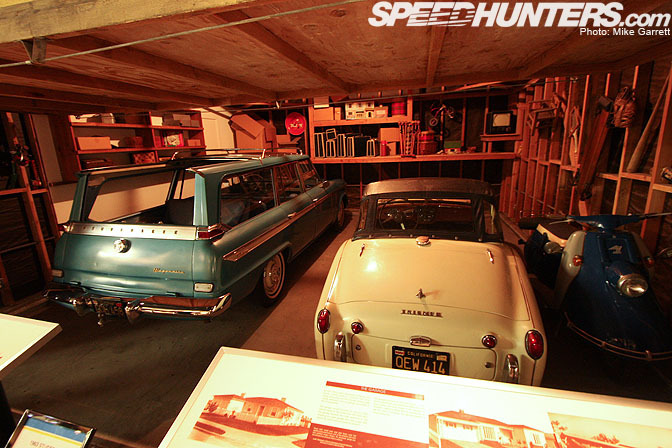 One more garage scene, this one from a 1960's SoCal suburban home, complete with a Studebaker open-top wagon and a Triumph sports car. 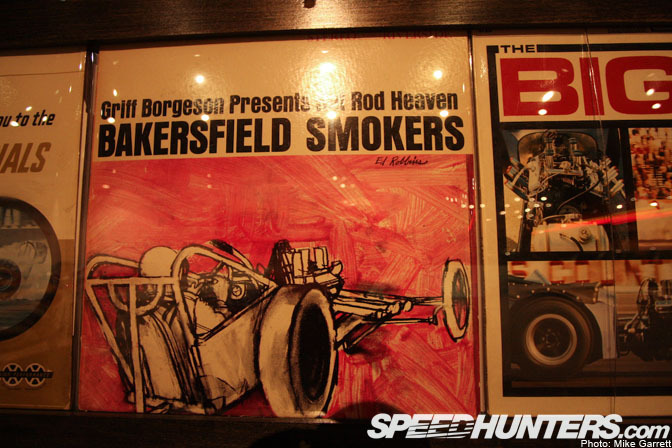 One of the featured exhibitions happening right now is dedicated to cars designed right here in Southern California. 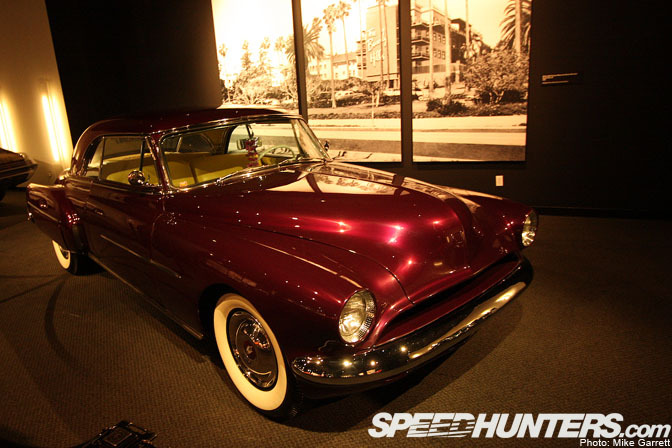 It includes everything from early Coachcraft cars to customs like the '50 Olds Polynesian built Valley Custom Shop. 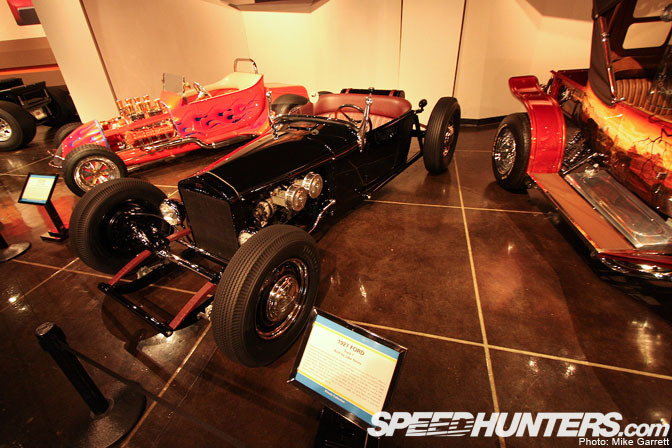 George Barris' "Zebra" Mustang is also part of the this display. You gotta love the "Super Stock Formula 1" tires. 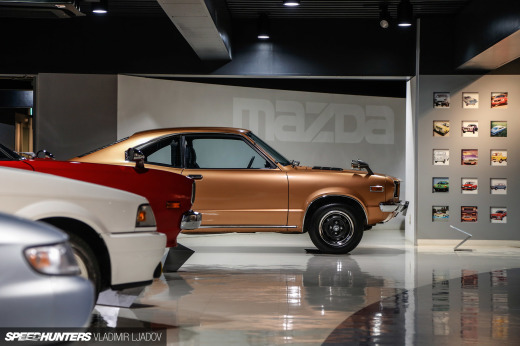 A pristine 1978 Toyota Celica is also part of this exhibit. 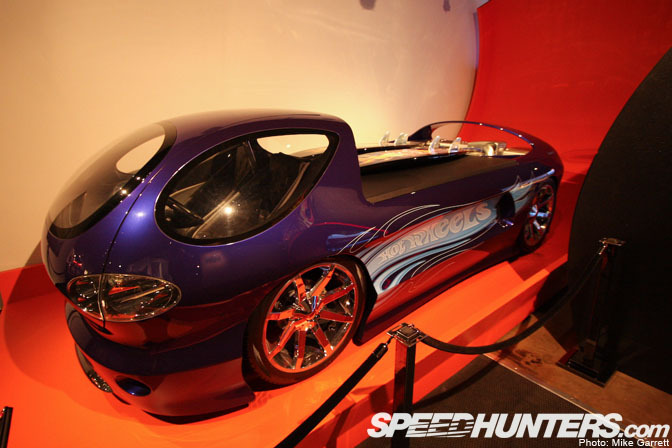 This car was created at Toyota's Calty design center in LA. 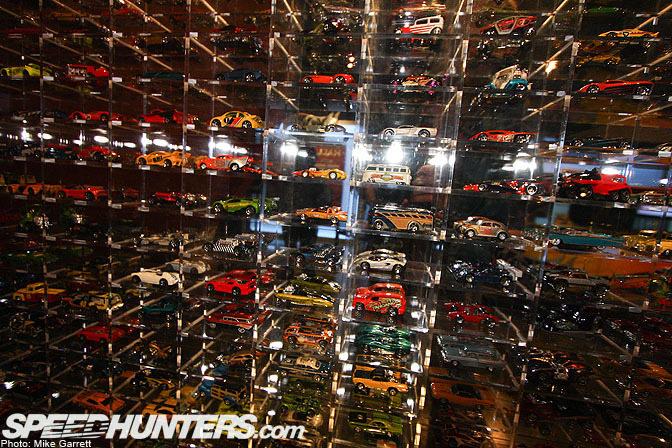 One of the permanent exhibits is the Hot Wheels Hall of Fame, dedicated to one of America's most well known toys. The lifesize version of the Hotwheels Deora II can be found here. 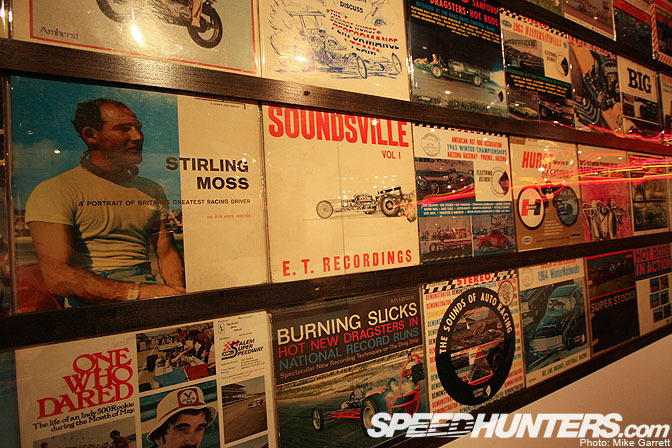 Another special exhibit, "The Sounds of Speed", featuring the artwork of nearly 200 automotive-themed LP's. 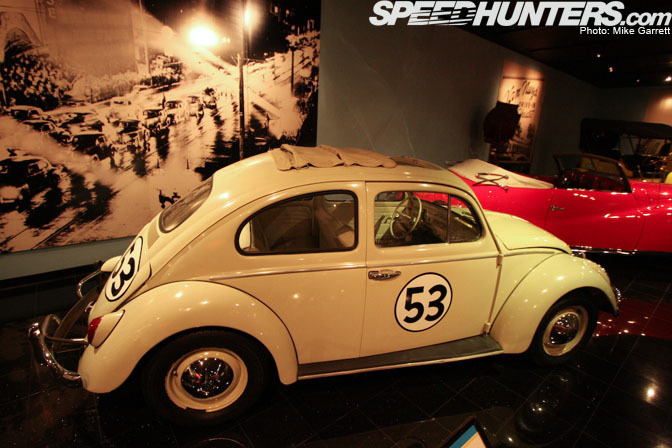 An LA car museum wouldn't be complete with out something dedicated to the cars of the silver screen. The Star Cars exhibit features machines like this '56 Jag owned by Steve McQueen. 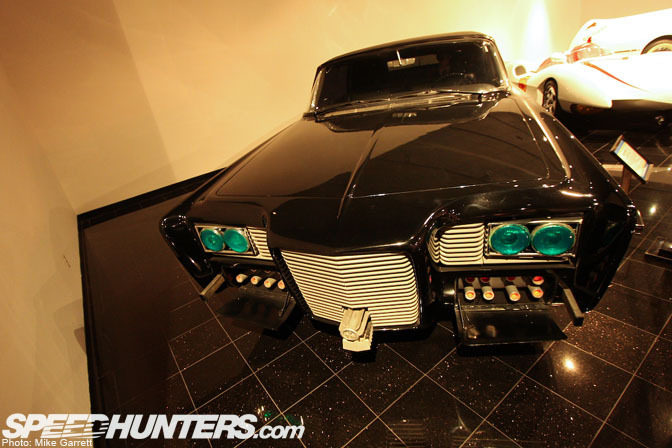 …as does the Black Beauty from the 1960's Green Hornet television show. 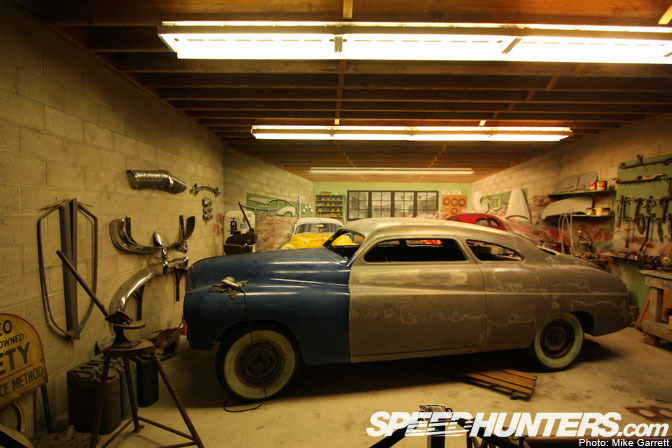 Another room houses various examples of hot rods, both modern and classic. 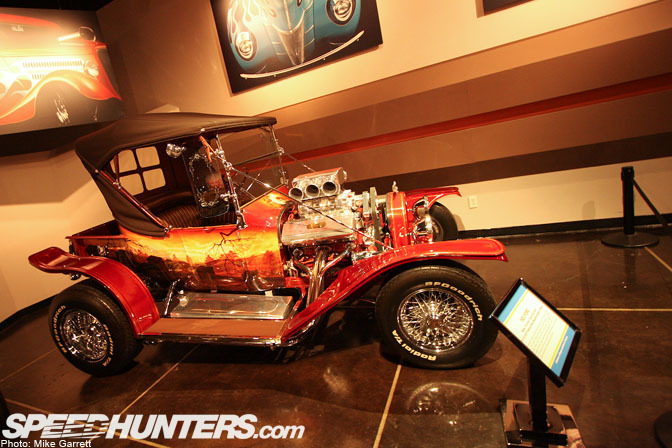 …but I'm not so sure about this over the top '23 Ford from the 1970's. 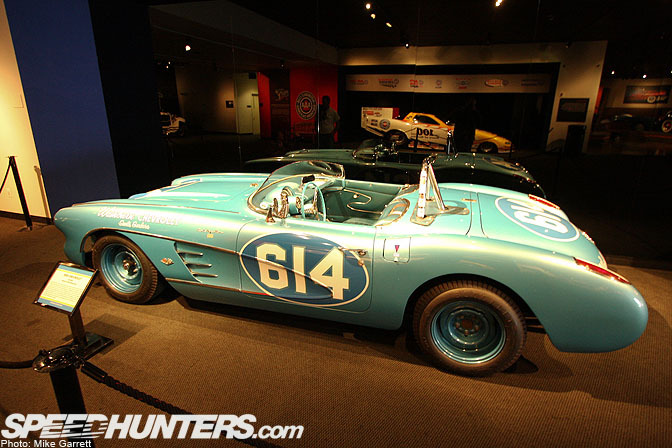 One of my favorite cars was this '59 Corvette raced by Bob Bondurant in the late '50s and early '60s. 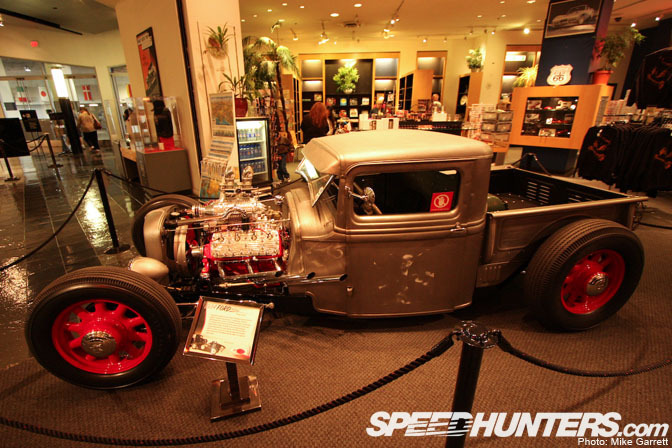 And finally, Jimmy Shine's '34 pickup, which can be found in the museum's gift shop. If you are ever in LA and have a few hours to kill, I highly suggest a visit to the Petersen Automotive Museum. I'll finish up tomorrow with a look at the special "Misfits of Motordom" display. sidenote: the ferrari on display has the plexiglass headlights, different from the popups + fogsin the movie......maybe just same model, but different car? Awesome!!! I gotta hit that museum sometime. 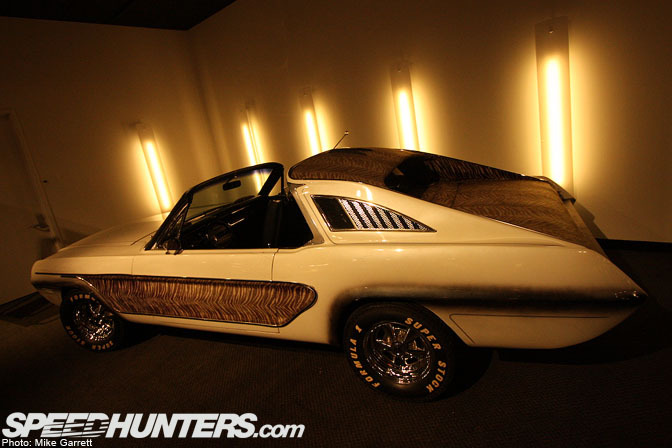 For those curious, the hot wheels Deora II was designed to hold 3 surfboards.. U can see two on the back. Not to be picky, but shouldn't "Herbie" have red and blue stripes? Great pics when I went last all I had was my phone camera. Another side note about the ferrari beside the front headlamp, is that the car doesn't have the fogs and it still has the rearview mirror which Raul breaks off in the beginning of the race. Great flix. Great article! Thanks for shooting the photos! 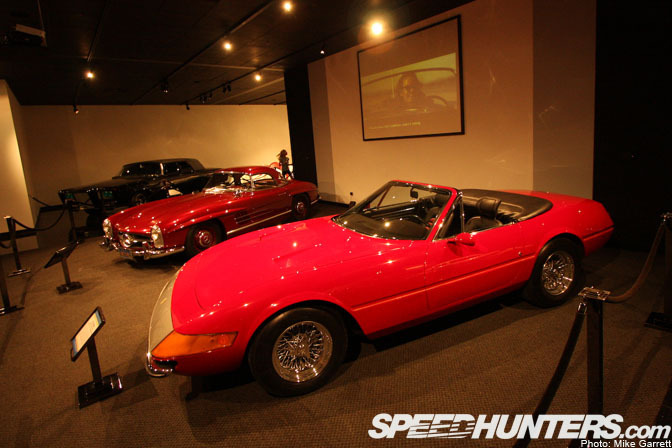 Yiso: There were two real Ferrari Daytonas used in the making of Gumball Rally. The other one was destroyed. This car unfortunately was repainted and modified after the movie. It doesn't actually have plexiglass headlight covers, that is silver paint. 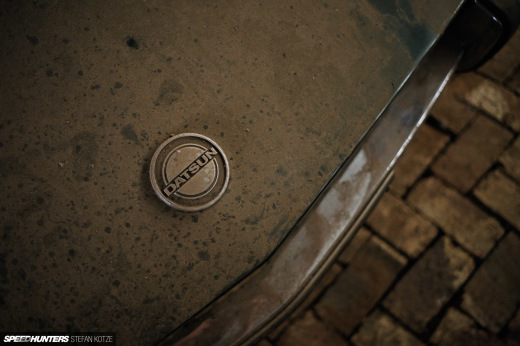 -But it is documented and that is the real car used in the movie. Wow, I never knew that Steve McQueen had an XK-SS. 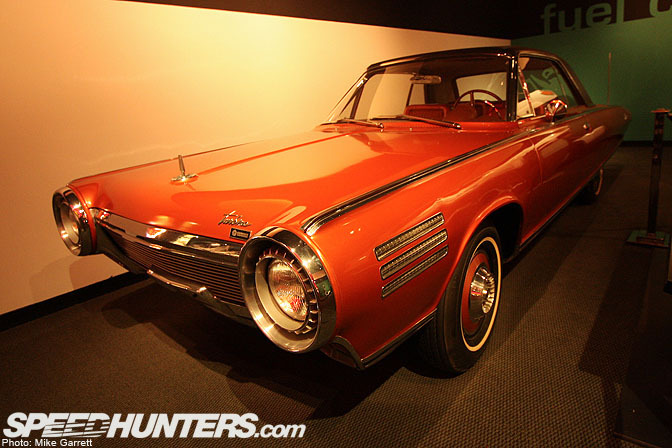 The Chrysler Turbine Car is one of only 55 produced by Chrysler in 1963. This is the only operational turbine car on public display. Do you guys fact check anything you write? June 16th 2009, Jay leno purchased one of 3 Chrysler Ghia turbine car's that had been in chryslers possesion. True this is not a model on "public display" but he never said it was. As you yourself quoted Jay has one of the few road going examples. Before you bust someone with your "facts" make sure you know what your proving or disproving. P.S. Mike- great article. @george....notice how it says PUBLIC display....Jay doesn't put his on public display unless he's driving it. Mopar Action I believe just did an article on it. Nice shots. I was just there two days ago shame I missed you guys haha. Sick shots! Mike fails. Tom fails. Joe fails. The game is find the missing adjective. George makes a good point. 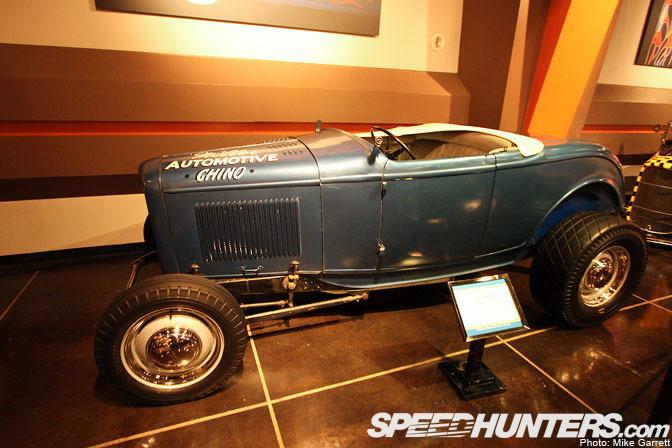 Why is Mike standing in the Petersen Museum, looking at a Petersen owned car, and making reference to Jay Leno's collection unless he is claiming that Jay owns the only working Turbine car or cars? If there is a working turbine car or cars outside of Jay Leno's collection, the reference doesn't belong in a story about the Petersen Museum. The statement doesn't make sense if the adjective is one, two, some, or anything less than all or the only. Yikes. Didn't mean to start a flame war. Just figured mentioning Jay's turbine car would make for a little better connection, especially to those not familiar with cars from this era. They were just saying you left out a word there Mike, the sentence doesn't make sence. Love those! That Zebra Mustang was in the first season of Get Smart. Except then it was fitted with all kinds of crime fighting equipment. Was that the Mach 5 I see in the background of the green hornet pic? Please post pics of the Mach 5. Nice cover up George. You're right Mike mis-typed a sentance. But you didn't accuse him of poor grammer you accused him of poor research, when in fact Jay Leno does own one of these cars. I think it would be fairly clear to anyone reading that Mike was not implying that Jay owns ALL of these cars. Well it wouldn't really surprise me if he did, it seems Leno can buy anything he wants, Cars, Talk shows, etc. "First-a rule of Italian driving: What's-a behind me, doesn't matta!" Haha, I love that movie! So much better than Burt Reynolds' "Cannonball Run" series, but maybe not as good as the original: "Cannonball!" from 1973. The "Zebra Mustang" is proof that even the King of Kustomizers gets it wrong sometimes! Little known fact: that Studebaker wagon was the inspiration for GMC's Envoy "XUV".